West Of the Moon is an abridged from Troll Fell, Troll Mill and Troll Blood which were published in 2004, 2005 and 2007. Book kindly sent to me by HarperCollins Childrens Books. Peer Ulfsson stood at his father's funeral pyre, watching the sparks whirl up like millions of shining spirits streaking away into the dark. The flames scorched his face, but his back was freezing. The wind slid cold fingers down his neck. Surely this was all a bad dream? He turned, almost expecting to see his father standing behind him, his thin tanned face carved with deep lines of laughter and life. But the sloping shingle beach ran steep and empty into the sea. You know when you read a book and you dread reaching the last page, because you instinctively you will miss the characters and the fantasy world they live in, well this is one of those books. I felt emotionally attached to the characters and wanted to know whether they ever returned to their original lives. As an abridged version of three books,the book is an epic 614 pages, allowing you to have plenty of time to make yourself comfortable in a world where Vikings, Trolls and Ice Giants all coexist, if not always happily together. The book is split into three parts with follow different events in Peer's life. The first part deals with Peer's relationship with his uncles and his need to escape their evil clutches before being handed to the Troll King as a slave. The second part shows Peer's desperation to appear more grown up in front of Hilde, by trying to bring the mill back to life. The last part follows Peer and Hilde as they travel to the land that is east of the Sun and west of the Moon. Each part, blends beautifully into the next one, leaving me disappointed at the end to find out there was no more. The first pages of the book lift you up and throw you straight in the horror that is to become Peer Ulfsson's new life. His father has died and his uncles whom he has never met before take him home to use as a slave. It is heart wrenching to read how they treat them. You find yourself gasping with horror with each incident. The darkness envelops you and you become desperate for Peer to escape his miserable life.. Peer's only salvations are his dog, Loki and his new found friend, Hilde. Peer's relationship with Hilde is beautiful to watch as it blossoms from childhood friendship to love. Throughout the book they are constantly thrown into difficult situations to tackle and work together to solve each problem. You are repeatedly urging Peer and Hilde to rebuild their friendship with love,as you can see they are suited to each other. Kathleen Langrish has created a beautiful landscape through her extensive world building. The attention to detail gives this fantasy land such an air of authenticity. You can easily picture the mill, the farm and Troll Hill as the hill becomes raised for each special occasion. There is a character within the book called the Nis, who I adored on contact. In my eyes, I viewed him to be a bit like Dobby from the Harry Potter films, only smaller. He helped with the cleaning and looking after the babies. He also becomes a sailor in the last part of the book. He is just a wonderful character to meet and definitely my favourite within the book. Out of the three parts of the book, I would say that I loved the first part the best. The introduction of the Troll King and his family had me enthralled. In this part, we also see that Peer's uncles get just what they deserve, after such ill treatment of Peer. I hated his uncles as soon as they turned up in the book and couldn't wait to see them suffer. I have never read anything about Vikings and trolls before, but Katherine has left me with a thirst for more information. I will be seeking out other Viking books to help calm my curiosity. I am also very curious about Katherine Langrish's future books as she will definitely be an author I will want to read again. Tomorrow on the blog, Katherine tells us about why she loves historical fiction. Lovely review, Vivienne! Putting Troll Fell on hold at the library as we speak. You have me convinced.Its lovely when someone is so enthusiastic about a book, this sounds like a real winner, I'm away to add it to my wish list now. I agree with the other comments here: this is a lovely review that conveys your enthusiasm. I will keep an eye out for this one. Yes I confess to believing in trolls as a kid. But then Scandinavian woods can look so magical. Great review Viv! Going to have to check out more from this author. 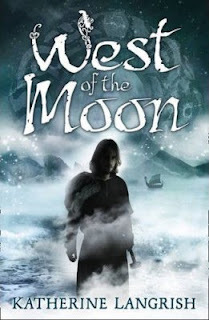 Wonderful review, I do love Viking history and the fantasy elements in West of the Moon sound great. I'm really tempted to try this one. Great review viv! Its easy to see how much you enjoyed this book. Nis sounds like a loveable character. Oh what a great review :) I had no idea until recently that this was three books combined! I've seen the Troll books around, and they always did appeal but I worried that they were aimed at a slightly younger audience than I normally read. I want to get to know Nis better. Great review! I hope I'll be able to find this book.